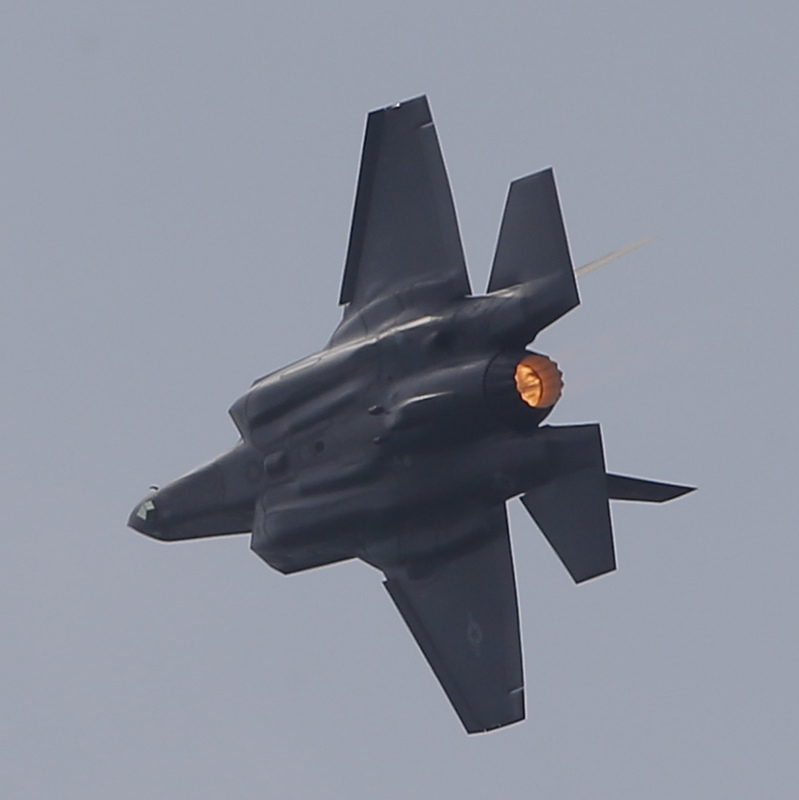 Israel Says F-35s See First-Ever Combat With IDF Over Syria : The Two-Way Israel's air force chief says F-35As were used in recent strikes against Iranian targets in Syria, the first "operational attack" for the newly fielded stealth jet. The US Lockheed Martin F-35 Lightning II performs a demonstration flight at Paris Air Show, in Le Bourget, east of Paris, France, last June. Israel's air force commander says recent airstrikes against Iranian targets in Syria were carried out by the F-35 stealth fighter – the first time the newly fielded warplane has been used in an "operational attack." "The F-35 squadron has become an operational squadron," Maj. Gen. Amikam Norkin said Tuesday, according to Haaretz. "We are flying the F-35 all over the Middle East - we might be the first to attack with F-35 in the Middle East," he said. "Norkin presented images of the F-35 over Beirut, Lebanon and said that the stealth fighter did not participate in the last strike in Syria but did in two previous ones. Norkin also said that Iran fired 32 rockets at Israel during the flare-up across the Syrian border earlier this month. According to Norkin, four rockets were intercepted by Israel, and the rest landed outside of Israeli territory. Speaking at a Herzliya conference, Norkin added that more than 100 surface-to-air missiles were fired at Israeli jets over Syria." "After [the Iranian attack] we attacked over 20 Iranian targets in Syria. Unfortunately, the Syrian air defense systems fired over 100 antiaircraft missiles at out planes and in response we destroyed their antiaircraft batteries," Norkin said. The F-35 Joint Strike Fighter, known in Israel as "Adir," or mighty one, is produced in variants for land-based and sea-based operation by U.S.-based Lockheed Martin. The United States has put up the greatest share of development costs and some estimates place the program cost near $1.5 trillion. It is considered the most expensive military weapons system in history. The air force chief's comments came amid a bipartisan effort by U.S. lawmakers to stop the sale of the F-35 to Turkey, one of several countries that participated in the aircraft's development. Congressional critics argue that President Recep Tayyip Erdogan's government is becoming "increasingly hostile and authoritarian" and might be drawing closer to Russia. Last month, Sens. Jeanne Shaheen, D-N.H., James Lankford, R-Okla., and Thom Tillis, R-N.C., introduced a measure to stop the transfer of the F-35A to Turkey. "Turkey's strategic decisions regrettably fall more and more out of line with, and at times in contrast to, U.S. interests," Lankford said in a statement quoted by Military.com. "These factors make the transfer of sensitive F-35 technology and cutting-edge capabilities to Erdogan's regime increasingly risky." Besides Turkey, the U.K., Italy, Australia, Canada, Norway and Denmark have been part of the development consortium for the warplane. Reuters notes, "Israel was the first country outside the United States to acquire the F-35. In December 2016, it received the first two planes out of an order of 50. According to Israeli media, at least nine have been delivered so far." According to The Times of Israel: "The fifth-generation fighter jet has been lauded as a 'game-changer' by the Israeli military, not only for its offensive and stealth capabilities, but for its ability to connect its systems with other aircraft and form an information-sharing network." Meanwhile, a new report by the House Armed Services Committee raises questions about the ability of the carrier-based version of the plane to meet the range needed by the Navy to strike enemy targets, according to Roll Call. "While the introduction of the F-35C will significantly expand stealth capabilities, the F-35C could require increased range to address necessary targets," the report states.